We’d love your help. Let us know what’s wrong with this preview of Last Night by Lorhainne Eckhart. To ask other readers questions about Last Night, please sign up. This is the final book in the series about Kate and Walker. Their relationship started under less than ideal circumstances, some might even say crazy. Kate met Walker when her date's ex-girlfriend was trying to kill her. So it only figures that their engagement would be more than slightly unusual! Life with Kate and Walker is anything but boring. If you've read the first two books in the series this finale is a must read. Walker wants his forever to be with Kate, and ONLY Kate. After he proposes, trouble comes literally knocking on his front door and it could threaten the couple's HEA forever. When a one night stand tracks Walker down after she does the unthinkable; his biggest fear is losing Kate in the process. I missed the earlier books in this series but still found this one to be enjoyable. It was fairly short and ended a little abruptly but was still a good read. Ms. Eckhart's characters are always real and draw you in quickly. You can't help but root for the main characters and hope that everything works out for them. It's like visiting with friends or family that you actually like and want to hear about their troubles and console them and rejoice with them with things work out. Love Ms. Eckhart's I missed the earlier books in this series but still found this one to be enjoyable. It was fairly short and ended a little abruptly but was still a good read. Ms. Eckhart's characters are always real and draw you in quickly. You can't help but root for the main characters and hope that everything works out for them. It's like visiting with friends or family that you actually like and want to hear about their troubles and console them and rejoice with them with things work out. Love Ms. Eckhart's books! I receive a free copy of this book in exchange for an honest review. I was immediately drawn into the last installment of Walker and Kate's story. This book was a quick read but was not short on the emotional suspense and family drama for which Eckhart is known. Her characters are always so real and raw. The plot is interesting and keeps the pages turning. The alpha her to keeps the pages steaming. This is a pleasurable read and I highly recommend this book. I received this for my honest review. This story will definitely keep your attention, Shelly is a one night stand from Walker's past she shows up at newly engaged Kate and Walker's house. As you can imagine this is going to get full of action, the thoughts and what ifs, I don't want to spoil it for anyone but will say it is full of the most extreme devious ways you would ever think. Certainly one you really do want to read. 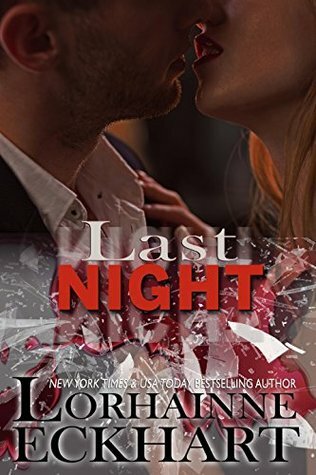 Last Night is the final book in a 3 book series that follows Kate and Walker's complicated relationship. It is full of drama and suspense that will have you turning the pages to see what happens.